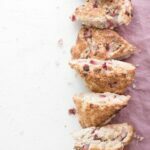 Recipe for Strawberry Coconut Scones, biscuit textured bread with fresh strawberries and coconut served with warm honey butter. Preheat oven to 425 F (220 C). Line a baking sheet with parchment paper. In a large bowl whisk together flour, sugar, salt, and baking powder. Add cubed butter and start to work the butter into the flour with your hands. Squeeze butter pieces gently with fingers while incorporated the flour mixture until it resembles cornmeal. Place bowl in the freezer for 15 min. Gently fold strawberries into the flour mixture. Then sprinkle and softly stir in the coconut shreds. Place dough ball onto lined baking tray. Mold into a flatter 8 inch circle. Cut into 8 equal pieces. Separate the wedges slightly to allow heat to move between each piece while baking. Bake for 22-25 min, or until toothpick in center comes out clean. Cool on rack for 10-12 min before serving. Stir together honey and softened butter in a small bowl, and generously slather onto a warm scone while sipping a fresh cup of tea! !